Silent Hunter IV leads players into the chaotic and blood thirsty land of world war 2 and into the heart of one of the wars most dangerous places which of course was the Pacific. The game utilizes excellent graphical content that runs very smoothly indeed and really does compliment the game as a whole. I love this game and cannot recommend it to you all enough as I think you`ll like it as much as I did. 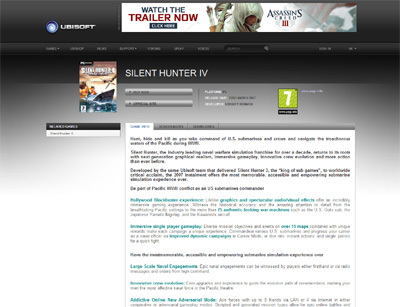 We have also compiled a Review System for this, of which Silent Hunter IV is Rated as Five Stars, the highest possible score available from the Game Review Team.